The eights race was won by NSW who led all the way. Victoria challenged about half a mile to go but this was repelled and NSW won by four lengths. The sculling race was narrowly won by Merv Wood from Ron Rawlins of Victoria. Wood's scull was holed and he was lucky to make the finish line. 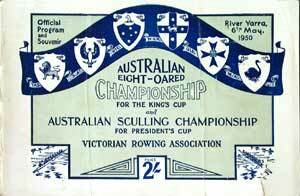 A sprained wrist half a mile from the winning post almost cost world sculling champion Merv. Wood (N.S.W.) the Australian Amateur Sculling Championship on the Yarra on Saturday. it was the luckiest win he had ever had. "My right wrist and hand would have been useless in another stroke or so, and I save a terrific sigh of relief when I heard the judge's gun," he added. like a bulldog. I couldn't shake him off, and my wrist was giving no end of trouble. "It was bad luck for Ron, because he's the greatest sculler Victoria has produced in 20 years." mile post was a length in front of Rawlins. Alan Jones (Tas.) and Sid Rogers (Q.) were several lengths behind. However, near the dock mouth, Wood executed a manouvre which in different circumstances could have led to his disqualification. He swung right across the stream and took up a position where he covered Rawlins and was able to watch him. Rawlins had "whittled"
Again the winning NSW crew hailed from Tweed Head & Coolongatta Rowing Club in Queensland.